RangpurSource is now the member of Bangladesh Domain Hosting Providers Association! How to convince your buyer to purchase your product by your desire rate? 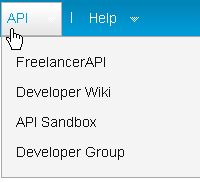 Freelancer has up to 10 menus. But all are not important for you at the same time and even round on your freelance career. So, that here I go to describes about the main menus. 1. Post Project: By using this menu you maybe have the permission to post a project with some minutes. Each project has a fixed refundable charge of $5. To post a project go to Post project page, put desire project name, type, description, budget, time and features then click Finish. After some moments your project will automatically be published. i. Latest Projects: You can find out newly published projects here. ii. Latest Featured: When you would go to post project, you have an option in bottom section of project page “Optional Features”, here you can see 4 types of features. 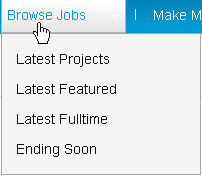 If you want to include your project as featured so then your need to check mark “Latest Feature”. For this function, you should be charged. iv. Ending Soon: You can find here the projects which will be ending soon. i. Bid On Projects: You can see here the whole projects posted on freelance and also can place bid according to your profile qualification. ii. Affiliate Program: You can find here the links of affiliation like text link ad, banner, RSS feed etc which we known by Referral link. By using this link you can make money here. iii. 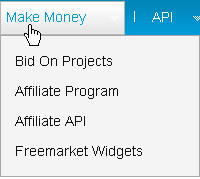 Affiliate API: It just used for freelancer API (Application programming interface). iv. 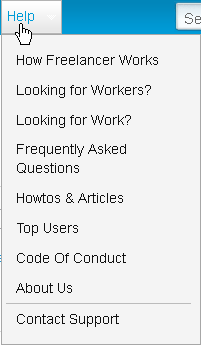 Freemarket Widgets: I think it’s not an important section for freelancer. 5. Help: A freelancer can getting help from this menu. more details for each, browse the individual link. 6. Dashboard: You can get all the recent work report from here। such as: notice, news feed, notification of project you won, some one bids your posted project, you sent or receive payment of your work. To know more details browse My Projects, My Messages pages. 7. My Profile: You can get all the info about your freelancer profile here. i. My Profile Details: You can change your profile info and also can upload or remove or change your profile picture from here. ii. My Email/Password: You can change your freelancer email id and password also from here. iii. My Qualifications: You can change your freelancer qualification, you checked whenever your joined freelancer. To remove qualification just uncheck and to add a new or just check one of each. iv. My Credentials: You can add here your academic qualifications like your education, certifications, awards, business license to make your profile strong, attractive and informative. v. View External Profile: You can view your profile with browsing this link. vi. My Setting: You can change your freelancer profile settings here. vii. Upgrade to Gold: You can upgrade your profile as a gold member from here. To get the benefits of it your are charged $24.95 per month. If your profile is insufficient of the end of month for gold member your will redirected to normal member. 8. Payments: All the information about payment receiving and sending you can find out here. i. Deposit Funds: You can deposit money from Moneybookers, PayPal, Wire transfer, Credit card, Web money to your freelancer account easily just follow some instruction step by step given by freelancer when you transfer. ii. Automatic Payments: If you need urgent money in your freelancer account but you don’t have sufficient money in your online account like Moneybookers, PayPal, Web money, then you have a chance from freelancer deposit system where you can get your targeted amount. Minimum $25 to maximum $500. For this you should be charged for per step amount you deposit. iii. New Milestone Payment: If you are works as a buyer, then you need to use this system to send hanging payment to your providers or workers. This is because; you and your provider get trust both on them and start a clear business relation. Whenever you work done by your provider then you should release this milestone payment. iv. 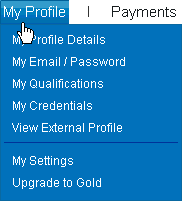 Manage Milestone Payments: You can create, cancel or manage your milestone payment from here. v. Transfer Funds: To send payment for any project issue or direct transfer you can use this system. 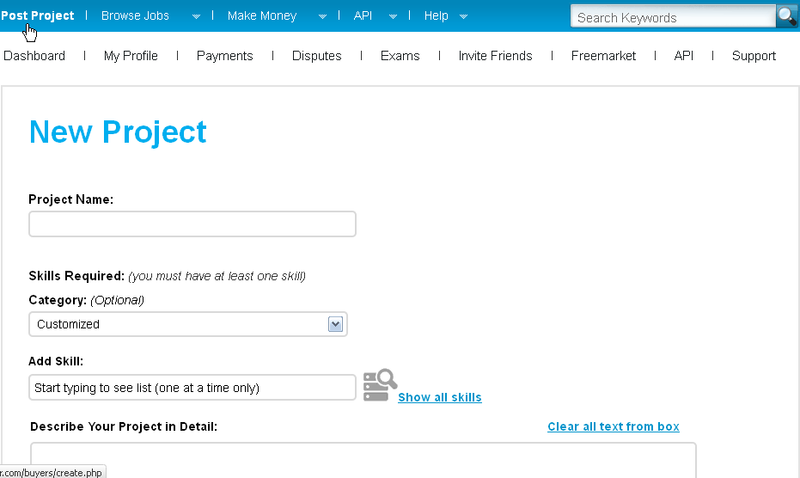 But now a day without project reference, if you send payment to another, your account is being temporary locked by freelancer. It’s so critical to unlock your account. So, be careful about it. vi. 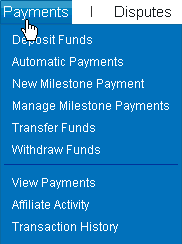 Withdraw Funds: By using this menu you can withdraw your freelancer balance with 4 easy ways. 1. PayPal, 2. Payoneer MasterCard, 3. Moneybookers and 4. Bank Wire system. Each from every system have their own system of trasaction. But I just show how to transfer with moneybookers account. vii. 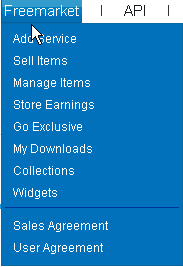 View Payments: Same as Manage Milestone Payments. viii. Affiliate Activity: If anyone registered here using your freelancer referral link, you can see here or have any earning stats also. ix. Transaction History: All of your freelancer transaction history you can see here with date, time, amount. 9. Disputes: If you and your buyer have any problem with payment or project issue then you must make a dispute to freelancer authority to solve it here. 10. Exam: Freelancer has different types of exam in several categories for develop, make profile strong and increasing project wining change. To get the change of wining project frequently take your desire exam and make your profile strong. The entire exam, you need to purchase them individually for $5 and can take 3 free exams from the bottom of the categories. 11. Invite Friends: It work as like Affiliate Activity. You may refers your friends and stuff to join here with your. 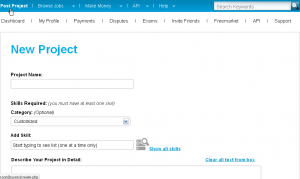 Freelancer marks your referral and pays you 20% affiliates for per each. 12. Freemarket: Freelancers this platform is for buying and selling goods like eBook, database etc. 13. API: Same as step 4. 14. Support: You can take support from freelancer here. To get it you need to open a support ticket for enter there. This is the details study on freelancer menus. If you get any problem or difficulties to understand please leave a comment below. © Copyright 2010 - 2019 RangpurSource. All right reserve. Get our latest update delivered to your inbox, just a click away, Sign Up Now.